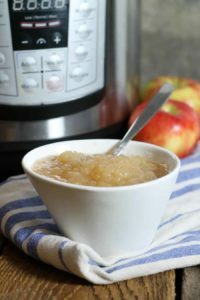 Instant Pot applesauce is easy to make, healthy, delicious, and best of all sugar free! With only a handful of ingredients, this homemade applesauce recipe is perfect for snacking, using in cooking, or preserving apples for the winter months. My whole family loves apples, applesauce especially, and my daughter will eat it everyday given the chance. Whenever possible I love making our food from scratch, and applesauce is one of those things. Just like apple butter, it just tastes so much better then any store bought product! If I can avoid bringing something packaged home, that’s one less thing in the landfill! So when I got my Instant Pot Lux-80 a few months ago, I couldn’t wait to try making applesauce in it! While making applesauce on the stove top isn’t necessarily hard, it does require some attention to prevent it from burning. It also takes three times as long! What Apples Are Best For Making Applesauce? 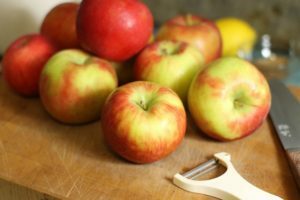 What are the best apples for making applesauce you may be wondering? Generally speaking, you want to choose apples that are fairly soft, have an intense flavor, and provide a good balance of tart and sweet. To keep things interesting, (especially for kids) you can even add fruit or berries to the apples to make flavors such as, blueberry applesauce, peach applesauce, or cranberry applesauce! Can I Use Whole Apples, Or Do I Need To Peel Them? 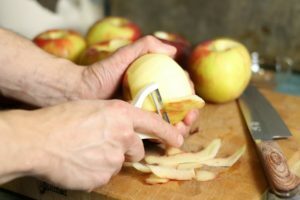 Do you have to peel and core apples before turning them into sauce, or can you use whole apples? It is best to at the very least core the apples. The seeds and tough core membranes do not break down very well, and will stay hard even after pressure cooking. If you prefer a smoother, less chunky applesauce texture, peel the apples before making the recipe below as I did. If you prefer a chunkier texture, feel free to keep the skin on! Always remember to wash the apples first to wash off any pesticide or other residue! How Do You Make Applesauce with No Sugar? 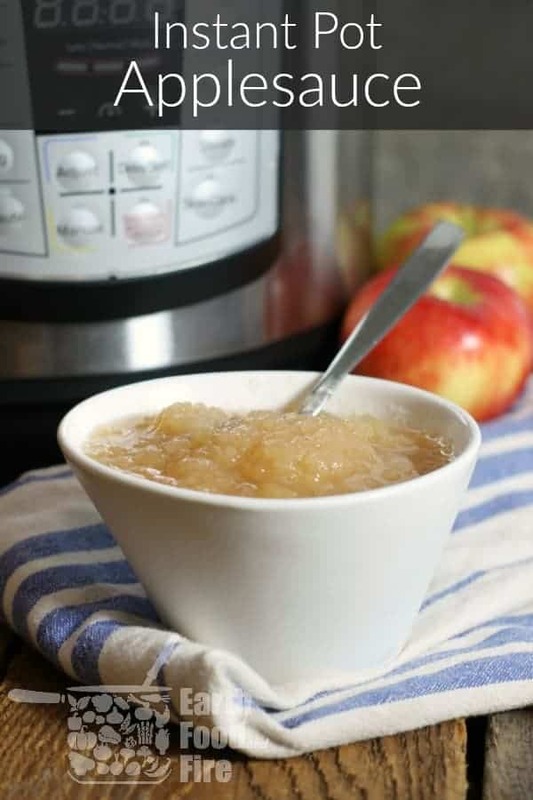 Lucky for you, this Instant Pot applesauce recipe is already sugar free!! If you choose a sweet variety of apple there should be enough natural sugar present that no added sugar is needed. If you add other fruits to the applesauce, it will make it even sweeter. If you are using tart apples, or you make the applesauce and find it a little to tart for your liking, simply stir in a tablespoon of brown sugar to sweeten it slightly. Start by coring and peeling the eight apples. You can do this the old fashioned way by peeling the apples, then quartering them and cutting out the core. Or you can use an apple corer to punch out the center of the apple. If you want to make this as easy as possible , a johnny apple peeler (amazon affiliate link) cores, peels, and slices the apples all at once! Next slice all the apples and place the slices in a bowl of water to prevent the apples from browning to quickly. If you are making a double batch, put a squeeze if lemon it vinegar in the water to further reduce the apples from oxidizing. Combine the water, lemon juice, spices, and salt, in the instant pot. 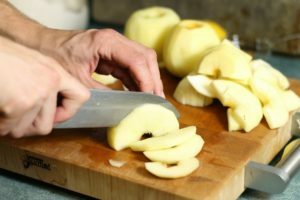 Strain the water out of the sliced apples, and add the apples to the instant pot. Stir everything to evenly distribute the spices. Lock the Instant Pot Lid in place, and make sure the pressure release valve is set to sealing. Select the ‘manual’ or ‘pressure cooking’ setting on your instant pot and set the cook time to 8 minutes. (If you left the peel on the apples set the time to 10 minutes to help break down the skins). Start the program by pressing ‘manual’ or ‘pressure cooking ‘ again. Now you can clean up and sit back and relax as the instant pot does the rest! Once the Instant Pot beeps signalling the cooking program has finished, release the pressure by turning the pressure valve to venting. Watch the steam as it is very hot and can burn you! If liquid starts to spit out of the vent. Close the vent and let the instant pot de-pressurize using the natural release method. Once the red pin drops, open the instant pot and stir the apple sauce with a risk to spoon to break up any large chunks! If you plan on canning the applesauce in glass mason jars for long term storage, do so know while it is still hot. Always make sure to use sterilized glass jars and lids to prevent contaminating the apple sauce. If you plan on simply refrigerating or freezing the apple sauce, scoop out the Instant Pot applesauce into a bowl or other appropriate container, and let it cool fully in the fridge. It is normal to seem slightly runny, and even watery while still boiling hot. As the applesauce cools, it will naturally thicken and set up a little. Once fully cooled the apple sauce can be frozen for up to 3 months, or stored in the refrigerator for up to 4 weeks. Start by coring and peeling the eight apples and place the apples in a bowl of water to prevent the apples from browning to quickly. Next slice all the apples and place the slices back in the bowl of water to prevent the apples from browning . Lock the Instant Pot Lid in place, and make sure the pressure release valve is set to sealing. Select the 'manual' or 'pressure cooking' setting on your instant pot and set the cook time to 8 minutes. Start the program by pressing 'manual' or 'pressure cooking ' again. Once the Instant Pot beeps signalling the cooking program has finished, release the pressure by turning the pressure valve to venting. If liquid starts to spit out of the vent. Close the vent and let the instant pot de-pressurize using the natural release method. Once the red pin drops, open the instant pot and stir the apple sauce with a risk to spoon to break up any large chunks! If you plan on canning the applesauce in glass mason jars for long term storage, do so know while it is still hot. 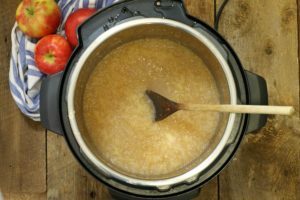 If you plan on simply refrigerating or freezing the apple sauce, scoop out the Instant Pot applesauce into a bowl or other appropriate container, and let it cool fully in the fridge. Can you believe I don’t have an instant pot yet? That’s going to change though, you convinced me I need one with this delicious applesauce recipe! I hope you get one soon! It’s a real time saver for many recipes! This applesauce looks amazing! I need to get my hands on an instant pot asap! Such a great use for the instant pot — so much easier than simmering apples on the stove all day. And I bet the kitchen smells amazing when it’s time to release pressure! Instant Pot for the win every time! I love this thing – especially for making life a little easier. I like that you kept the spices minimal to really let the apples shine! Oh, great! 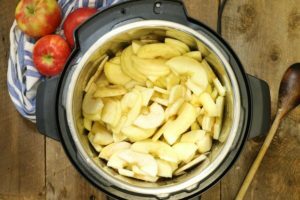 I’ve made apple sauce in a slow cooker for years, but this is so much faster (and more suited to small batches!) I’ll have to try it! I love homemade sauce and right now I wish I had an instant pot! Yours looks perfect and so easy to make for the season! I’ve always wanted to make my own apple sauce and I’ve recently wanted an instant pot so I’m thinking it’s time to do both! This sounds so yummy and so easy! Thanks for sharing. I love how fast the Instant Pot makes things, and this applesauce looks so delicious! Such a great way to use up all these apples! This looks fantastic, and there are so many uses – definitely going to put this on my morning overnight oats wit greek yogurt, what a sweet little addition it will be. We absolutely love the re-usable pouches. We use the Squooshi brand of pouches and our daughter just loves them! This is a use for my Instant Pot that I never thought of before! What a great idea! And love that it’s naturally sweetened and healthy! I thouyght it was pretty neat too, and the easy and speed of it makes it even better! I want to try making a pear sauce next! 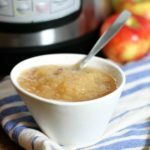 This is a super recipe for sugar free apple sauce and it’s so quick and easy to make in an Instant Pot. I also love the idea of adding extra fruit if desired. Perfect! I couldn’t beleive how well it turned out the first time I tried it! Adding blueberries is my daughters favorite! Apple sauce is a must in my kitchen, I use it to sweeten my bakes with, or it regularly serves me as my porridge topper! Love that you’ve made this in the instant pot! Homemade applesauce is the best. You can flavour it just the way you like. More cinnamon, less sugar…and some maple flavour. I don’t have an Instant Pot….but I do have a pressure cooker. I know I can make this work. YUM! Maple infused applesauce, now there is an idea! But yes, you could just as easily do this in any pressure cooker! Let me know how it turns out Gloria! I love that applesauce doesn’t need added sugar. Your idea of adding other fruits to it is a great one! That would really add variety. I can think of so many yummy uses for this applesauce! I bet it’s absolutely delish over Greek yogurt! Love how quickly it comes together too in the Instant Pot.